Nigel Frost is one gorgeous guy. Wow, that is one amazing tail! 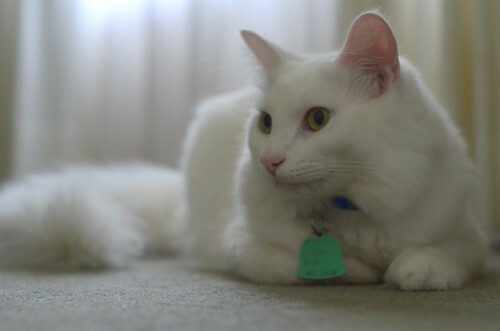 Such a beautiful boy cat. Is his coat as soft & silky as it looks???? It's not as silky as Charlene's, but it's soft. His tail is a little course. Oh, Nigel is SUCH a beautiful cat! 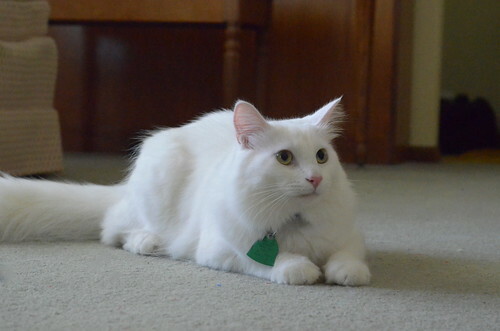 He looks like a cloud of fluffy marshmallow! Like a marshmallow with a marshmallow fluff tail! Swoon! He's a heartbreaker! My girl cat just said she has a crush on Nigel. I know! He's like a feline Fabio! That he is. And your folks are lucky to enjoy his company, Laurie. I know which cat is which, but, when I see Nigel's tail, part of me always thinks it's Mimsey, because she's a girl and girls (like Charlene) should (in my mind) have those great tails! He really looks like a Norwegian Forest Cat in these photos. What a stunner! Nigel (and Mimsey in the previous post) are just so silky and shiny I can't stand it! I just know they smell good, too. ;) If cats had shampoo commercials, these two would be naturals! Oh my goodness. He is such a handsome boy kitty! Your parents are so lucky to have such gorgeous cats. Again I am amazed by the sparkling white coat-so pretty! I want to bury my face in his fluffy neck and snorgle him. The fur! I want to brush this cat. If he would let me. My heart is officially stolen! I wonder if he'd disappear entirely in a snow drift? What a gorgeous guy. That tail is as big as the whole rest of that Nigel kitty! Tell your parents never to get a white furry bathroom rug as long as they have this floofy boy. 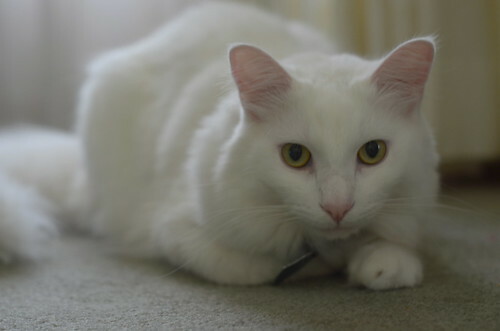 We have a white Angora and she loves to get herself all tucked on the rug. It's generally fine, but it's scary as all get out when in the middle of the night you get up to use the toilet, and all you see are a pair of yellow eyes staring at you from the bathroom floor! LOL @ "all you see are a pair of yellow eyes staring at you from the bathroom floor"! It's the Pretty Kitty Committee this week! He looks exactly like my dear departed Elliott, but Elliott did not have tail floof like Nigel. He was 17 pounds of attitude and love. Still miss him. Kisses for Nigel the magnificent! These two must be constantly grooming themselves. How else do they get their whites so white?! LOOK AT THAT TAIL!!!!!!!!!! It's flooftastic!! This boy's tail definitely gives Charlene's tail a challenge. Indeed such a pretty floofy boy kitty with a magnificent tail!